We really appreciate it when a customer takes the time to leave feedback about their buying experience with Imperial Cars and are pleased to share some great reviews from some happy customer who recently found and purchased their perfect Mini from us. 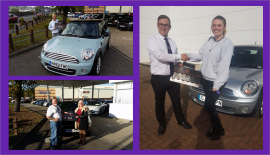 What lovely comments - we are so pleased we were able to help these customers purchase their Minis! If you are in the market for a Mini, we have now made it easier to find the one for you! Although you will find a small selection of Minis at each of our branches, Imperial Cars Swanwick has now become our dedicated Mini Centre. So why not come and browse around 100 Minis currently in stock at Imperial Cars Swanwick or pop in and visit us at 258 Bridge Road, Lower Swanwick to see our wide range of Minis for yourself.